The problem of failed states becomes acutely relevant in the modern world. States cannot bear their responsibilities not only in the Middle East, Africa and Asia. 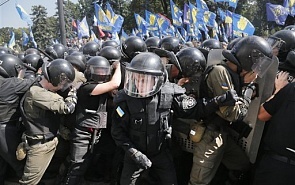 The experience of Ukraine and Bosnia and Herzegovina shows, that this is happening in Europe. The consequence of the public institutions ineffectiveness leads to the loss of the central monopoly on violence in favor of paramilitary, criminal and public associations. The militarization of civil society becomes a powerful driving force of the state policy. It is hard to imagine how one can pacify public passions in Ukraine, if the Minsk-2 agreement is finally fulfilled. After two years of implacable civil strife, instigated by influential mass media, Kiev may face strong public resistance to the settlement of the Donbas crisis. In his article Raffaele Marchetti analyzes the role of civil society in conflicts. He investigates the ways where social forces are the main drivers of the conflict dynamics, seizing the initiative from the state. The relationship of identity, a failed state and the militarization of social consciousness is becoming an increasing cause of deep and protracted conflicts - now also in Europe as well. The consequence of the public institutions ineffectiveness leads to the loss of the central monopoly on violence in favor of paramilitary, criminal and public associations.